Leaders of ARTBA’s Public Private Partnerships (P3) Division presented policy recommendations in a series of meetings with key members of Congress and staff last week during the ARTBA Federal Issues Program. In a new policy paper, ARTBA advocates for continued growth and efficiencies for the TIFIA program, lifting the cap on the use of Private Activity Bonds (PABs) for highway projects, and removing barriers to tolling. ARTBA P3 Division President Tom Stoner of H.W. Lochner, Vice President Matt Girard of Plenary Group, and Chris Fronheiser of AECOM led ARTBA’s delegation. Highlights included a discussion with Rep. Jimmy Duncan (R-Tenn.), who is chairing the House Transportation & Infrastructure Committee’s special P3 panel. The group also met with the panel’s Republican and Democratic staff for an in-depth discussion on ARTBA’s recommendations and the current P3 market. They rounded out their day on Capitol Hill with staff for the bipartisan House P3 Caucus, as well as aides to Sens. Michael Bennet (D-Colorado) and Roy Blunt (R-Missouri), who have co-sponsored key infrastructure financing legislation. CAPTION: ARTBA P3 Division President Tom Stoner of H.W. 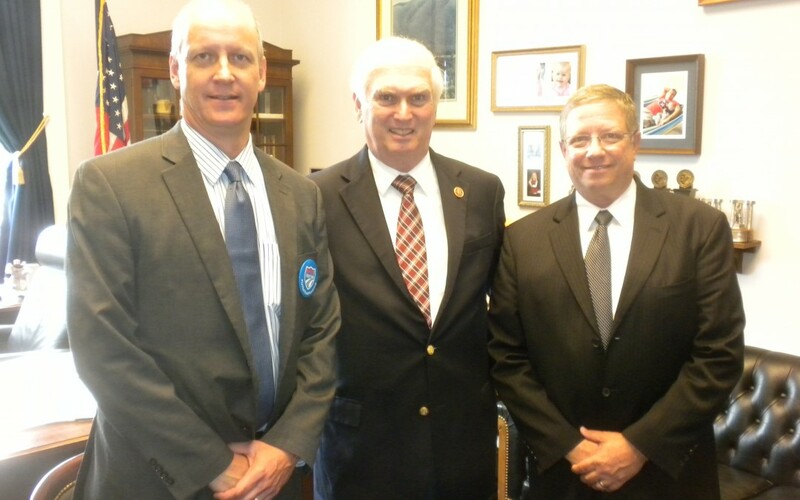 Lochner (right) and Vice President Matt Girard of Plenary Group (left) meet with House P3 Panel Chairman Jimmy Duncan (R-Tenn.).